I just found your site off of Tastespotting. First of all, your daughter is beautiful! She looks so happy! 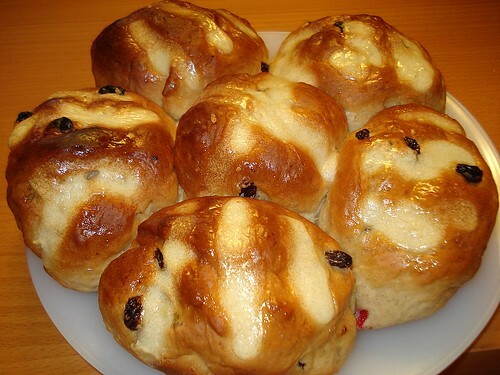 :) Second of all, the hot cross buns look delicious!! I'll definitely be checking back here again. much respect and admiration camemberu and hubby! have a nice weekend ahead! Your daughter looks soo bubblely and cute!! he has great plans for Nadine. Thank you everyone for your heartwarming comments! Nadine is 20 months old today! Lisa, I substituted some flour types (trying to use up the remnants I had) - 1 cup self-raising flour, 1 cup cake flour and 2 cups bread flour, thereabouts. A bit less yeast (6 teaspoons, I used instant). And a splash more milk, I think. Nadine looks gorgeous and so happy! I hope she'll be this happy for a long time to come. I've always wondered though, when meeting a special person, is giving them extra attention (even if it's of the nice kind) going to emphasise their differentness to them and make them feel odd? 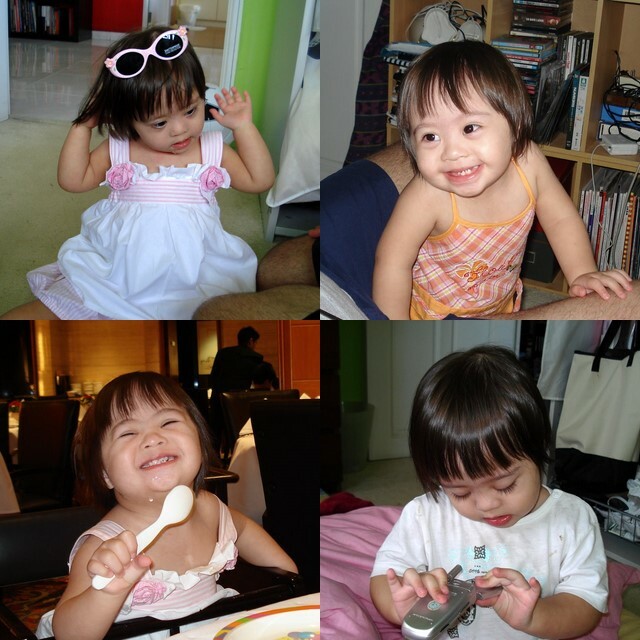 Nadine is still as adorable and happy. Really love her smile. Good question, Laura. I think this concern arises from the "I'm disabled but I don't need your sympathy" school of thought. Personally I don't think you can do enough kindnesses for a less fortunate person. More often than not, they are already treated as outcasts/oddities and shunned, stared at, whispered about or God forbid, abused. They already know they are different. Will your act of warm kindness make them feel odd? I'd wager that it's more likely going to make their day. So go ahead. Better to err on the kind side, don't you think? I came across your site searching for High Tea recommendation. I feel your love and warmth thru' this blog. Nadine is a lovely child. My sis & my 4 years old nephew is in town and we look forward to gather together in a relax atmosphere next friday. I will give Helia or Rose Veranda a try. Thanks! Thank you very much, Kelly! I hope you, your sis and nephew enjoy your high tea! I am so inspired by your joy and zest for life especially for your family and FOOD!. Keep up the good work and may you continue to inspire people around you.